Ever drive by Clyde's on Route 1 by the Walmart and ask yourself, "Who goes there?!" Well the answer is, "I do and you should, too!" Don't let the lack of windows scare you away, it is totally a great restaurant AND family friendly. Sometimes I go with friends for a night out and sometimes we go as a family. 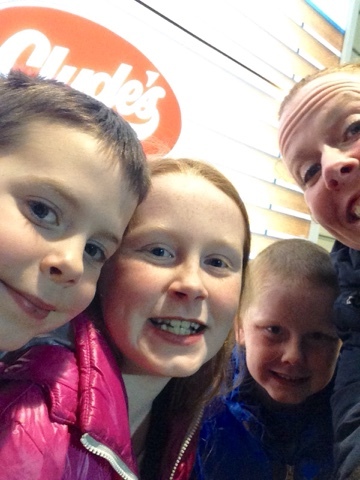 Last night, my husband had plans of his own so the kids and I hightailed it to Clyde's for dinner. We all love it! We took this pic last night to taunt my friend, Lauryn, who also loves Clyde's! The burgers are TO DIE FOR. The pizza (particularly the BBQ Chicken) comes in a close second in my book. The menu ranges from burgers/sandwiches to Mexican style food to traditional favorites to Texas BBQ. There is definitely something for everyone. The portion sizes are amazingly, stuff-your-face large. The staff is also always super friendly and low- key. You never feel rushed there which I love. The kids' menu has all the favorites (we went with cheeseburger, hot dog, and grilled cheese last night) and they get Oreos for dessert. Who doesn't love a restaurant that gives out Oreos? The kids also get a little trinket/prize with their meals - last night was a plastic sheriff's badge. Cute, right? The kids also love it there because in addition to a menu that they can color, the tables are covered with brown paper that the kids can draw on. Each table also has a deck of cards at it so you can pass the time playing your favorite game. Daniel MAY have beat me at War last night. So yes, the main dining room is totally family friendly which I wouldn't necessarily have known just from driving by. Although they did recently have an exterior facelift to the building which gives it a bit more curb appeal. Spoiler alert, the new "windows" out front are fake! There is also a separate bar area as well if that's more your scene. So there you have it - I give Clyde's two thumbs up. Oh, and I've received no kick back for writing this post. I just drove by the restaurant today while running errands and thought how I always have such a great time there and wanted to share it with you. So if you've been on the fence about going (or never considered it), I'm telling you to go for it!